ONE does not usually associate very high speed and wide speed range with aircraft of the "tailless" type. Yet these two desiderata have, according to the new handbook of the Halton Aero Club, been kept prominently in mind ДальшеMore>>> in planning the "Meteor," a Halton-designed and Halton-built monoplane, which is now nearing completion, and the general arrangement drawings of which are here given. From past experience the Halton Aero Club has come to the conclusion that really high speed is necessary if prizes are to be won in competitions and at meetings, and the "Meteor" was designed with this object in view. Without accusing the Halton designers of having copied Captain Hill's "Pterodactyl" design, it must be admitted that the Halton “Meteor" has many features in common with that machine. This applies to the general "scheme" only and not to details, which are a good deal different in the "Meteor." Although designed as a racing machine, the twin-engined arrangement of the power plant has been chosen, the engines in question being Bristol "Cherubs." One of these is mounted in the nose and the other in the stern of a small nacelle, the pilot's cockpit being situated between the engines. 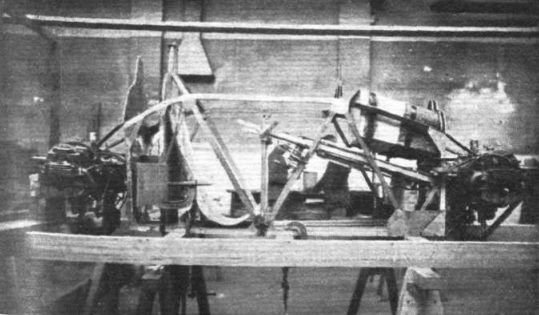 The undercarriage is of unusual type, the two wheels being, like the engines, placed in tandem on the centre-line of the machine. The front wheel is steerable, and should enable the machine to be taxied on the ground with considerable ease. In the air, its side surface and that of its "trouser" will also act as an air rudder, although it seems somewhat doubtful whether this fact will be altogether an unmixed blessing, the wheel being placed fairly far forward. The wheels, by the way, have internal shock absorbers. 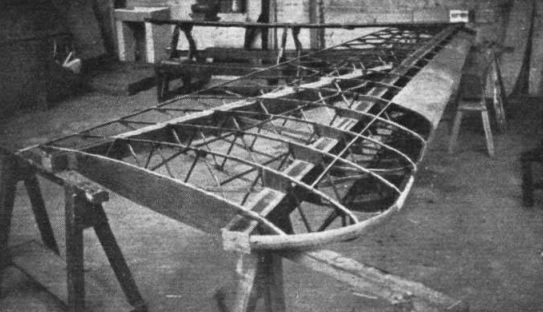 Outboard rudders are fitted at the tips of the wing proper, consisting of pivoted surfaces carrying skids so as to balance the machine on the ground when it is "cycling" on its two in-line wheels. The monoplane wing is tapered in chord and thickness, and has a pronounced sweepback. At the tips are "controllers" which, worked in the same direction, operate as elevators owing to their rearward location, and when worked in opposition to each other act as ailerons for lateral control. Along the leading edge of the main wings are "pilot planes," which are automatic in action and are designed to have the same effect as Handley Page slots. Finally, it should be pointed out that the design of the "Meteor" was practically completed by the summer of 1928, but many difficulties have had to be overcome, not only due to the unusual design but also to other causes. It is now hoped, however, that the machine will be finished in the near future so that flying tests can be carried out in the spring of this year. The designed performance of the "Meteor" is ambitious, the estimated speed range being 25-120 m.p.h. If this is attained it will be the highest speed range of any machine ever produced, and will beat even that of the Handley Page "Gugnunc." THE HALTON AERO CLUB'S "METEOR": This photograph snows the nacelle with the two Bristol "Cherub" engines. The general layout is illustrated in the three-view general arrangement drawings.